Right-angled triangles have one internal angle of 900 (a right angle) shown as a red block in diagram. In a triangle, all of the internal angles add up to 1800. 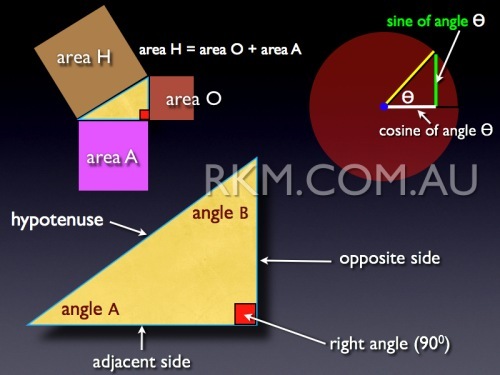 The side opposite angle A is called the opposite side, the horizontal side is called the adjacent side and the longest side (corresponding to the radius in the diagram at upper right) is called the hypotenuse. In this calculator you can get the values of the sine of angle A (opposite divided by hypotenuse), the cosine (adjacent divided by hypotenuse) and the tan or tangent (opposite divided by adjacent). The relationship between circles, sines, cosines and tangents can be seen in our sine wave & cosine animation and in our tangent graph animation.